Search Results for "catch and release"
Shark fishing - man sport fishing on boat in Florida. Close up of fierce shark. Man releasing shark cutting line in catch and release of spinner shark. From Florida keys. Shark fishing - man sport fishing on boat in Florida. Travel tourist man catch and release of spinner shark. From Florida keys. Man fighting and winning battle fight against shark while shark fishing on boat in Florida, USA. Sport fishing Travel tourist man catch and release of spinner shark. From Florida keys. Fishing - tired exhausted proud sport fishing man after shark fishing fight. Wiping sweat of forehead sweating happy enjoying catch and release fishing in Florida Keys, USA. catch and release of beautiful brown trout. Aerial drone scene top view of fly fishing man casting. Catch and release. Green and beige sand on the bottom of the lake under the water. Patagonia Argentina. Aerial drone scene of fly fishing man casting. 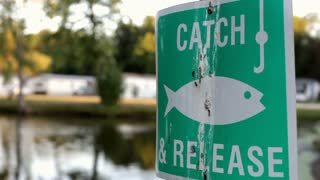 Catch and release. Green and beige sand on the bottom of the lake under the water, mountains and forest, clouds on the sky. Patagonia Argentina. Fly fishing, catch and release. Rainbow trout, Oncorhynchus mykiss. Detail of persons hands while taking off the green wooly bugger fly. Villarino lake Patagonia, Argentina. Slow motion 120 fps. Fly fishing, catch and release. Rainbow trout, Oncorhynchus mykiss. Persons hooks a trout. Villarino lake Patagonia, Argentina. Slow motion 120 fps. Fly fishing, catch and release. Releasing rainbow trout, Oncorhynchus mykiss. Detail of persons hands holding the trout and putting it in the water. In patagonia, Argentina. Slow motion 120 fps. Fly fishing, catch and release. Releasing rainbow trout, Oncorhynchus mykiss. Detail of persons hands holding the trout in the lake moving it for oxigen. In patagonia, Argentina. Slow motion 120 fps. Fly fishing, catch and release. Hooked fish fighting to be released, splash and jump of trout, rainbow, Oncorhynchus mykiss. In patagonia, Argentina. Slow motion 120 fps. A fisherman practices catch and release. Fishing - man sport fishing big game shark fishing on boat in Florida. 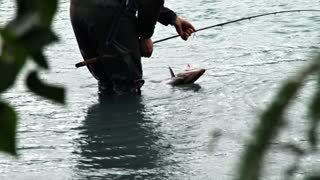 Travel tourist man catch and release of spinner shark. From Florida keys. Shark fishing - man sport fishing fighting shark biting showing teeth on boat in Florida. Close up of fierce shark. Travel tourist man catch and release of spinner shark. From Florida keys. 2018 - U.S. President Donald Trump speaks about his immigration policy and catch and release in sanctuary cities. beautiful brown trout is ready to get its freedom back - catch and release. Flyfishing, catch and release. Releasing rainbow trout, Oncorhynchus mykiss. Detail of persons hands while fish returns to the lake. In patagonia, Argentina. Slow motion 120 fps. Fly fishing, catch and release. Releasing fontinalis trout, Salvelinus fontinalis. Detail of persons hands while fish returns to the lake. In patagonia, Argentina. Slow motion 120 fps. Fishing man portrait - tired proud sport fishing man after shark fishing fight. Happy fisher enjoying catch and release with fishing pole in Florida Keys, USA. 2018 - U.S. President Donald Trump speaks before a cabinet meeting about catch and release and the worst immigration laws in the history of the world. Fly fishing, catch and release. Fontinalis trout, Salvelinus fontinalis. Detail of persons hands while taking off the green wooly bugger fly. Villarino lake Patagonia, Argentina. Slow motion 120 fps. Fly fishing, catch and release. Releasing rainbow trout, Oncorhynchus, in patagonia lake. Detail of persons hands while holding fish from the grass. Reel at the side. Argentina. Slow motion 120 fps. Fly fishing, catch and release. Detail of fishing rod and line while collecting the line. In patagonia, Argentina. Slow motion 120 fps. Fly fishing, catch and release. Releasing rainbow trout, Oncorhynchus mykiss. Detail of persons hands while fish returns to the lake. In patagonia, Argentina. Slow motion 120 fps. Fly fishing, catch and release. Releasing fontinalis trout, Salvelinus fontinalis. Detail of persons hands while holding and cleaning the fish. In patagonia, Argentina. Slow motion 120 fps.